April 22nd, 2019 ― Doha: Under the theme of "A Call for Mercy", Qatar Red Crescent Society (QRCS) announced today the launch of its annual Ramadan campaign for the year 1440 A.H.
Kabul, Afghanistan – Afghanistan’s Civil Service Institute’s (ACSI) Women’s Career Development Center has the equipment and information system it needs to help women who are seeking employment. The U.S. Agency for International Development (USAID) provided computers, small office equipment and a management information system to the center so that it is fully functional and able to continue supporting job applicants on its own and without donor support. Some information in this report came from Reuters. More than 1 million Afghan children, particularly in conflict-stricken regions of the country, were deprived of polio vaccinations in 2018 because of actions taken by Taliban and Islamic State militants, Afghanistan health officials tell VOA. In the provinces Kunar and Laghman HealthNet TPO is responsible for all the health care in clinics and hospitals since the beginning of 2019. Alongside this task, we will start some other activities. With the UNDP we will start distributing impregnated mosquito nets for protection. We will support vulnerable women with hardly any income with a cash support program sponsored by the Ministry of Public Health. And in Laghman we will run a community based nutrition program with support of Unicef to fight malnutrition among children. Co-chairs of Immunization Management Group (IMG) announced that the global goal set out in 2013 of 126-OPV using countries to introduce 1 dose of IPV in their immunization programme has been achieved. 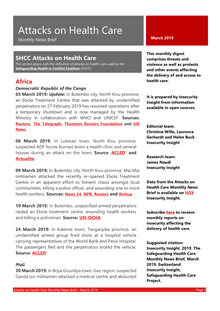 In March 2019, Action on Armed Violence (AOAV) recorded 2,132 deaths and injuries from 263 incidents of explosive violence around the world, as reported in English-language media. 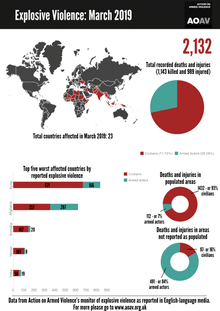 Civilians accounted for 72% (1,529) of the deaths and injuries recorded. When explosive violence was used in populated areas, 93% of all casualties were civilians, compared to 16% in other areas. After heavy rainfall that affected 22 out of the 34 Provinces of Afghanistan over the past few days, the death toll has risen to at least 16. 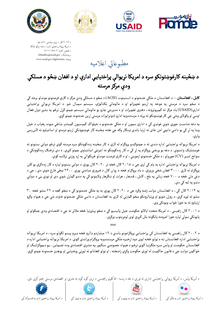 According to media, as of 18 April at 8.00 UTC, in eastern Nangarhar Province, 11 people have died, six are injured and 266 houses were washed away, while in the western Province of Herat the death toll stands at five. Over the next 24 hours, weather conditions are expected to improve in the affected Provinces. Moderate rain with isolated thunderstorms is forecast in the northern and north-eastern provinces. 1. There were more cases of wild poliovirus in 2018 than in 2017. Should we be discouraged? No, not at all. We’ve always expected the number of cases to fluctuate somewhat as we get closer to zero. We’ve gone four straight years with fewer than 100 cases per year. That’s an indicator of great progress. With dedication from governments and Rotarians in areas still affected by polio, we’ll get there. 2. Why is it so difficult to eradicate a disease like polio? Kandahar, Afghanistan – Today, sixty women graduates received government-issued certificates recognizing their year-long training and work experience through the U.S. Agency for International Development’s (USAID) internship program. USAID’s internship program equips women with the knowledge and skills to qualify for jobs with the Afghan civil service. 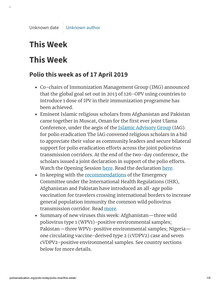 Islamabad, 17 April 2019 —Eminent Islamic religious scholars from Afghanistan and Pakistan have reiterated that polio vaccines are not only safe and in compliance with Islamic principles, but also a religious and moral duty incumbent on all parents, in a joint declaration issued at the Afghanistan-Pakistan Eminent Ulama Conference. 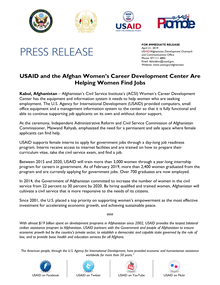 Kabul, Afghanistan – The U.S. Agency for International Development (USAID) held a women’s empowerment event today for graduates of the Women’s Leadership Development (WLD) Jawana and Royesh programs. Senior Afghan government officials, leaders in the private sector, and civil society representatives attended the event, which highlighted the achievements of the WLD graduates and strengthened their support network as future leaders in Afghanistan. Heavy rainfall has been affecting 16 out of 34 Provinces of Afghanistan over the past 48 hours, causing widespread flooding. 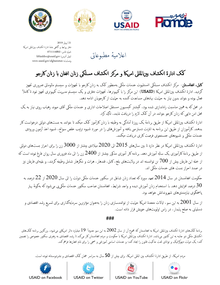 Herat Province is most affected (particularly the districts of Obey, Kohsan, Karrokh, Shindand and Guzara). According to media, as of 17 April at 8.00 UTC, five people lost their lives due to a house collapse in the western Herat Province and 17 people more are missing following a flood in Obey District. In the capital, Kabul, the Kabul River burst its banks and 110 houses have been damaged. Residents of four villages in Kabul province faced a hopeless situation several times year when heavy rains brought flooding, destroying crops and access to essential services. A recently completed river bank protection flood wall, built with support from the Irrigation Restoration and Development Project, now protects farms and homes against the floods, giving stability to livelihoods and unimpeded access to services. The members of the Security Council condemned the announcement by the Taliban of a spring offensive, which will only result in more unnecessary suffering and destruction for the Afghan people. 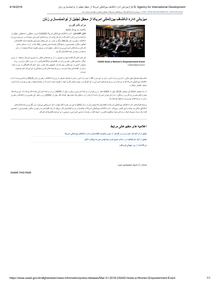 The members of the Security Council recognized the Afghan people’s strong desire for sustainable peace in Afghanistan. They underscored that calls for more fighting will not advance the goal of making a sustainable peace. On both sides of the historical 2640-kilometre-long border between Pakistan and Afghanistan, communities maintain close familial ties with each other. The constant year-round cross border movement makes for easy wild poliovirus transmission in the common epidemiological block. KANDAHAR - Activists in Kandahar are turning to social media to better coordinate and strengthen efforts to promote women’s rights. To help further the effective and safe use of social media, Kandahar field office of UN Assistance Mission in Afghanistan (UNAMA) hosted a discussion with 20 women representatives of civil society, local media, provincial council members, teachers and university students active on social media. On Saturday 14 April, in Lagham province an unexploded ordnance detonated near a group of children, causing a large number of casualties.Reports indicate that six children were killed and another eight were wounded. Afghan security forces responded and established a security cordon. The wounded children have been transported to the provincial hospital in Mehtarlam City. NGOs are advised to avoid the area until security forces have completed their work. Venezuelans were the second most common applicants in the EU+. In February 2019, some 57 000 applications for international protection were lodged in the EU+. Despite a small decrease compared to the first month of the year, this monthly figure remained higher than the average over the past twelve months, and considerably higher than applications in February 2018 (46 000 applications).